Find out what's new in Zoho Desk. Augmented Intelligence for your team. Zia is a context-aware candidate we've hired for your team. Powered by AI, she can perform crucial tasks like sentiment analysis and anomaly detection. She also doubles as a conversation assistant to help customers find solutions through ASAP, Zoho Desk's in-app customer support tool. Process Management made simple and stress-free. Blueprint helps businesses bring discipline into customer service. It lets you build processes easily, and ensure that customers get predictable, timely, and consistent customer experiences. Bottlenecks become easy to track and address. 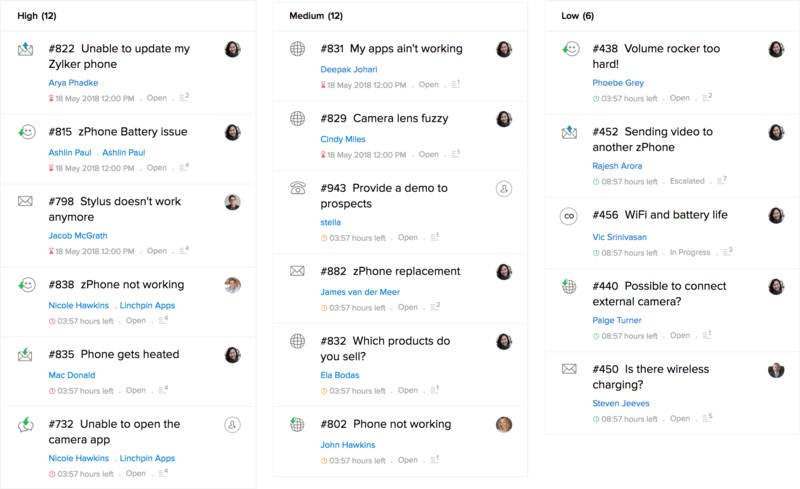 Blueprint saves your team a ton of time, and lets you focus on what's important. Build, sell, and host extensions. Zoho Desk is now listed on Zoho Marketplace and can be accessed by developers to build, host, and sell extensions. Everything built on the platform will be hosted on Zoho Marketplace, making it available to a customer base of over 30 million users. Now you can build niche solutions for your business and customise Zoho Desk extensively. Real-time analytics on the go. Radar gives agents and managers a comprehensive overview of vital customer service stats from the convenience of their mobile phones. Critical areas such as ticket resolution time, customer happiness, live traffic, and individual agent stats can be monitored on a day-to-day basis, so exceptions are caught well in time. Focus on your customer better, with added context. Work modes intuitively organize tickets and direct agent attention to the most important customer conversations. Priority Mode, the newest of Zoho Desk's work modes, organizes tickets based on the priority levels your team sets. This way, agents can address high-priority tickets first, and continue to keep tabs on the other tickets. Viewing more tickets on the same screen is essential for teams that deal with a large volume of tickets every day. Compact mode displays nearly twice as many tickets as the Classic Mode on a single screen, allowing an agent to quickly scan the tickets before clicking on the one they need. As the name suggests, the Recent Items tab gives you a comprehensive list of all the activities an agent has engaged with recently. If you wish to review a ticket you've responded to, or call a customer you'd called earlier in the day, you can access these actions from the Recent Items tab at the bottom of your page. Ticket threads are composed of interactions between agents and customers throughout the ticket resolution process. Opening a ticket repeatedly is time consuming. 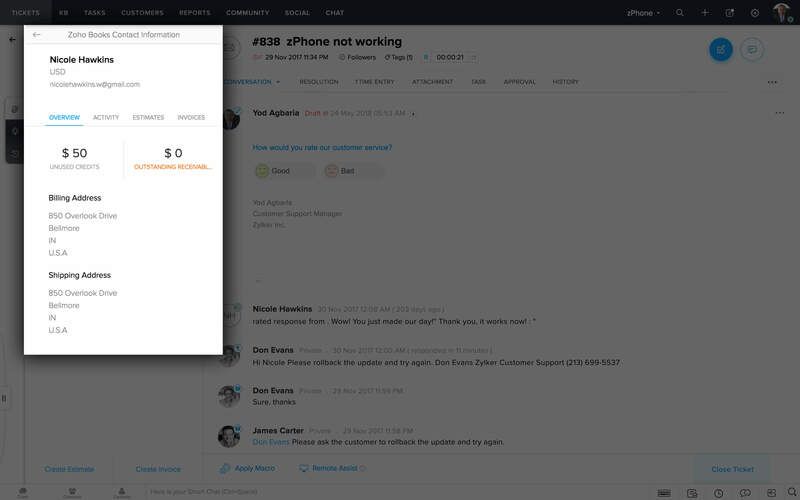 Ticket Peek offers agents all the context they need to reply to the ticket, without actually opening it. 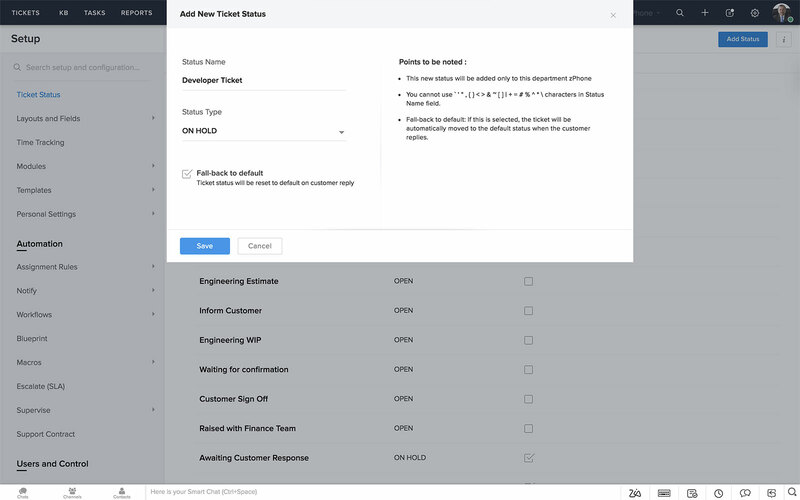 It's a lightweight screen that displays every interaction the support team has with the customer, as well as the ticket's properties and related solutions from your Knowledge Base. Snippets allows agents to formulate responses quickly, using pre-set shortcuts and phrases. When you enter a short-cut and press "tab", Snippets will insert pre-written phrases into a response. For example, if you type “Thanks” and hit Tab, Zoho Desk automatically inserts “Thanks for reaching out to us!” into the editor. You can choose from Zoho Desk's default snippets or create custom snippets. Solving customer tickets may require agents to collaborate across departments, and include external consultants as well. Until your team reaches a solution, the customer doesn't need to be involved in internal conversations. The private thread function in Zoho Desk helps agents keep internal and external conversations separate by marking certain ticket threads "private". This way, agents and customers get the information they need, without any hassles. 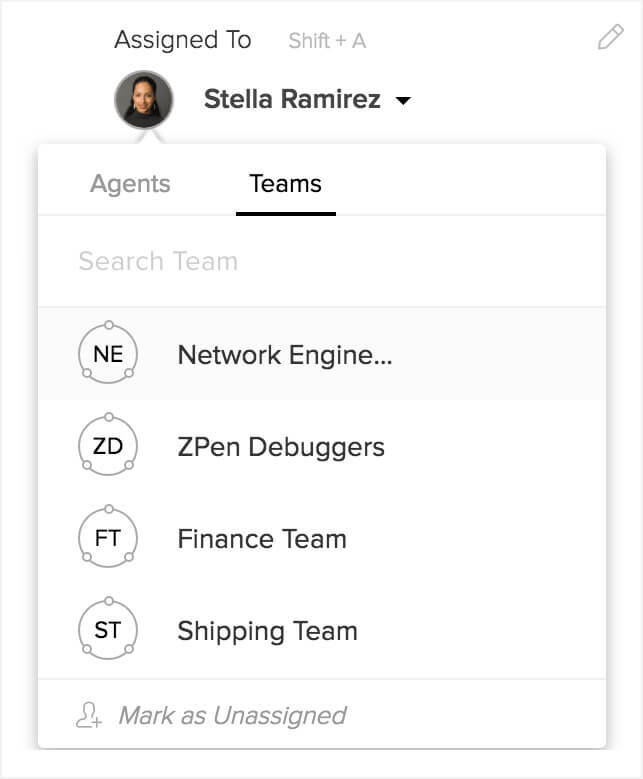 Zoho Desk now lets you organize your agents into teams based on your business's needs. Where one agent would rush to tackle their tickets, agents can now handle them together as a team. Teams are department specific and a lot more flexible. Agents can tag teams on relevant tickets and, assign tickets to teams instead of individual agents. Zoho Desk now lets you hit pause. Sometimes, agents may need to pause actions related to a given ticket while they rope in the product team or solve pending issues. The On Hold state makes this possible by letting you stop the timer, and preventing the ticket from going overdue. Once the issues are solved, you can change the ticket status back to 'Open'. It also has a new set of views, including On Hold Tickets and My On Hold Tickets. 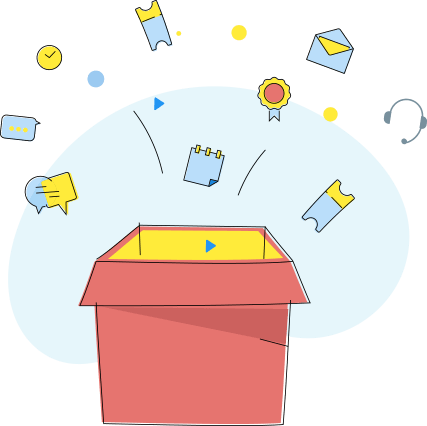 Ticket sharing lets multiple departments work on a single ticket without getting in each other's way. By sharing the ticket, the parent department retains control of the ticket, but allows the child department to access and work on it simultaneously. If you wish to move the ticket to a different department, that is possible as well. A new view called Shared Tickets, will be created for all agents, in every department with shared tickets. Layouts help you organize your fields in each module. They help you get information you care about, quickly. With this update, each department can now have a unique layout. Agents can create and use custom fields in each department without interfering with another department's layout. They can also configure department-specific picklist values for custom fields. Click on ‘Layouts’ in your Setup to give it a try now! The Knowledge Base and Community modules in Zoho Desk's Help Center have some new enhancements. Every time a customer posts on your Community Forum, a ticket is automatically generated in Zoho Desk. Within this ticket, agents can change the "forum status" whenever necessary. In your KB, you can now format content with pre-set styles and edit the permalink right from within the article. Zoho Desk no longer relies on the Ticket ID in the subject line of emails to identify which ticket a given response is part of. It reads the header information from the email to automatically put the incoming response under the right ticket. You can now set up Zoho Desk to automatically or manually track the time spent by your agents on their tickets. These can be added as time entries and associated with estimates/invoices you create. When you hit "search" in Zoho Desk, your search results will now be categorized into facets like status, channel, priority etc., so you can quickly get to the exact item you were looking for. Each time you click on a facet, the search results will narrow down further, and show you only the records included in that facet. 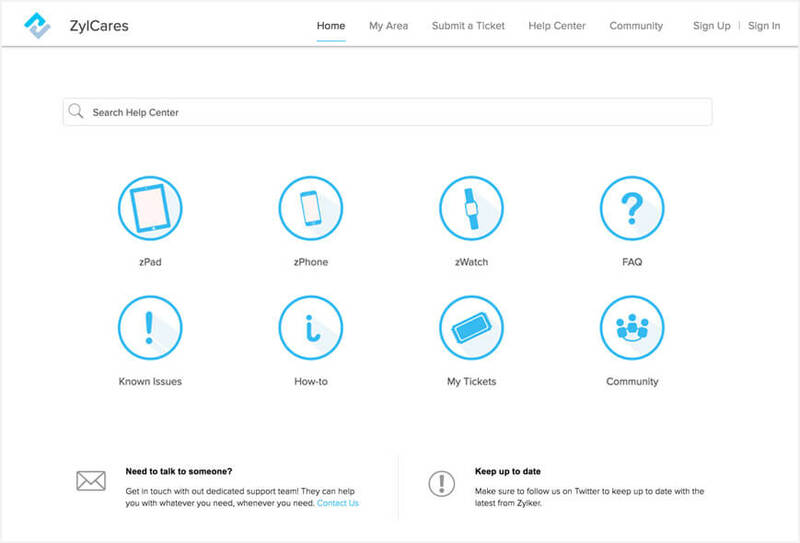 Table View is useful when you want more control over the ticket information you see. This is a tool for users who find themselves limited in terms of the level of information that is being offered in the Classic View and Compact View. With an upper limit of 15 columns, agents can look at most ticket details without having to open the ticket. A simple way to engage your user community is to incentivize their participation. With Gamescope for Zoho Desk, you can set these up in a jiffy. With points, levels, and badges, encourage your community to participate proactively. Recognize the time and effort they put in to share their ideas, feedback, and doubts. Customer service is just a tap away. The ASAP plugin for Zoho Desk is designed to embed customer self-service capabilities into your websites and mobile apps. Empower your customers with a searchable knowledge base, interactive community and Zia, an AI-powered chat bot built to provide contextual help to your customers wherever they are. The Zoho Desk UI has gotten a makeover to improve your navigational experience. 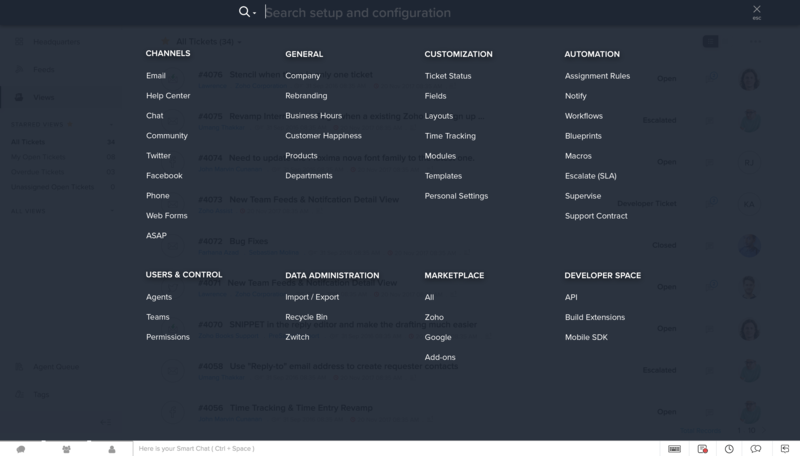 You can now access all the modules from the top bar, and Search and Quick Add are more prominent. Ticket sub-tabs are placed right below the subject of a ticket, while Auto-Suggested Articles and the Ticket Timeline are now on a tab below Ticket Properties. We've made some changes to the Setup interface to make it easy for you to find the features you want. Bridge the gap between Sales and Support, and capitalize on cross-selling opportunities with the latest Zoho CRM integration enhancements. The integration includes features like Related Lists, Handshake Mode, and Team Chat. These aim to build context from the ground up for contacts, conversations, and processes. Work with better context when you can access your customer's billing and payments-related information from your help desk. The Zoho Books integration allows agents to view outstanding payments, raise an estimate or invoice within a ticket and/or change the payment status as required. With the new Time Tracker feature, you can also keep track of time spent on a ticket and bill clients or pay consultants accordingly. Bring team collaboration, ticket assignment, and vital stats into a single chat window, with the Zoho Cliq integration. Slash commands allow agents and managers to view recent tickets and customer happiness ratings, and monitor agent performance. Cross communication and collaboration have never been easier! Zoho Assist seamlessly integrates with Zoho Desk to give your customers a hassle-free remote assistance experience. 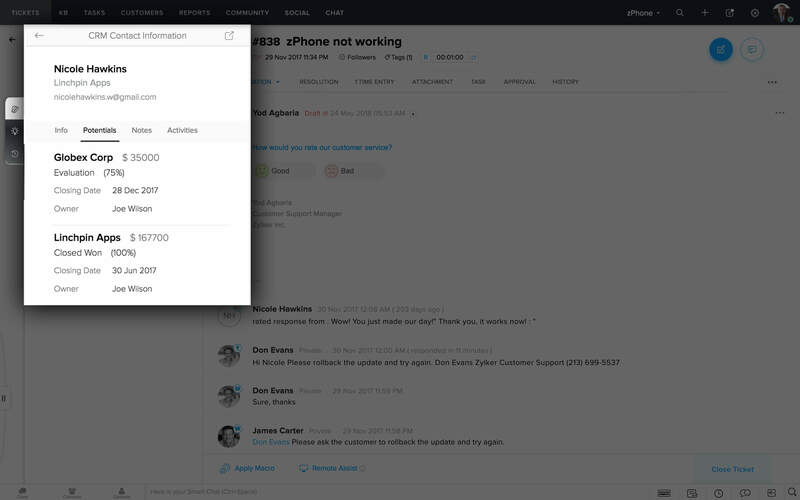 Agents can now identify problems easily and fix them within minutes by controlling their customer's screen. Remote assistance saves time and increases efficiency. Data is crucial in customer service, but it can be overwhelming at times. Zoho Desk's integration with Zoho Reports lets you get the most out of your data through advanced analytics. Choose from over 75 ready-made reports and dashboards, or even create custom ones for your business. Draw up insightful information like response time data, SLA-based reports, and Customer Happiness Ratings, in a matter of seconds. Social media is an increasingly popular way customers reach out to businesses. Zoho Desk now allows agents to convert messages received on Facebook Messenger into tickets and respond to customers through the same channel. If your team uses Jira for project management, and Zoho Desk for customer support, then this integration is for you. Bugs in Jira can now be filed from Zoho Desk. Bug Status in Jira can now be seen from Zoho Desk. Comments added in both software reflect in both now. 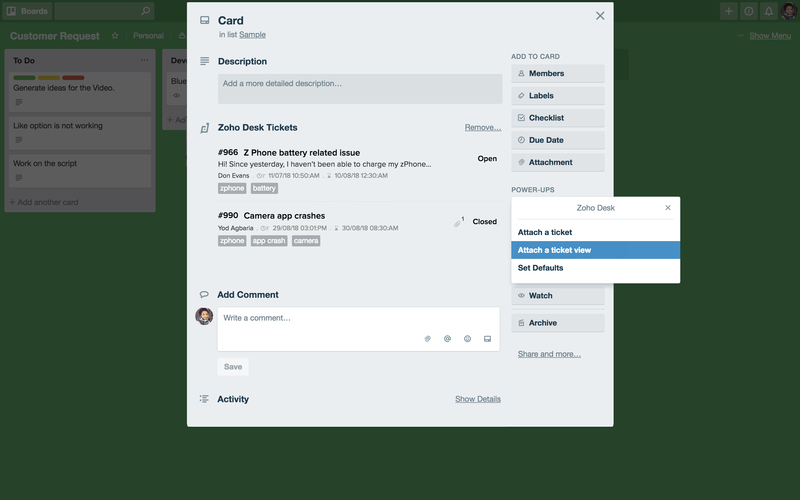 Thousands of teams using Trello for internal task management can now link a task with a ticket (or a list of tickets) in Zoho Desk. That way, crucial customer context now flows from frontline teams to operations teams. Zoho Desk now integrates more deeply with Google Analytics to bring you a dashboard with all the aggregate metrics (like total visits, average time on page, pages seen per visit, and bounce rate) as well as overall numbers split up by source and location. 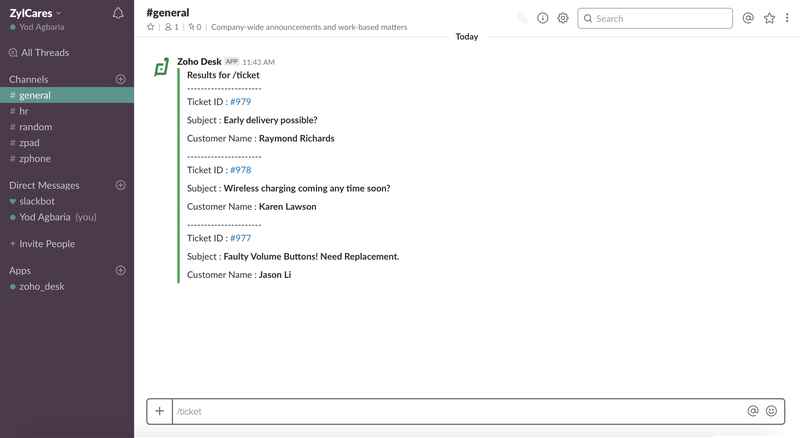 By connecting specific departments in Zoho Desk with specific channels in Slack, you can have ticket-related notifications automatically show up on Slack. 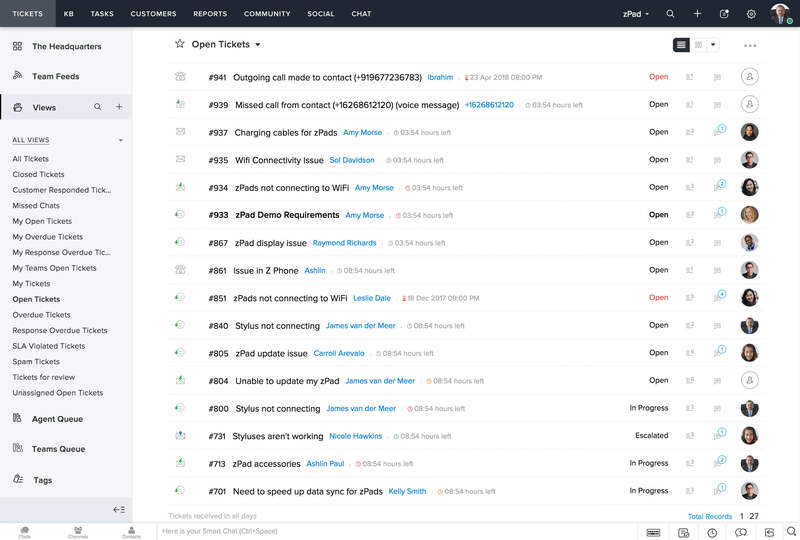 You can also use slash commands to keep an eye on latest tickets, daily performance metrics, and more. 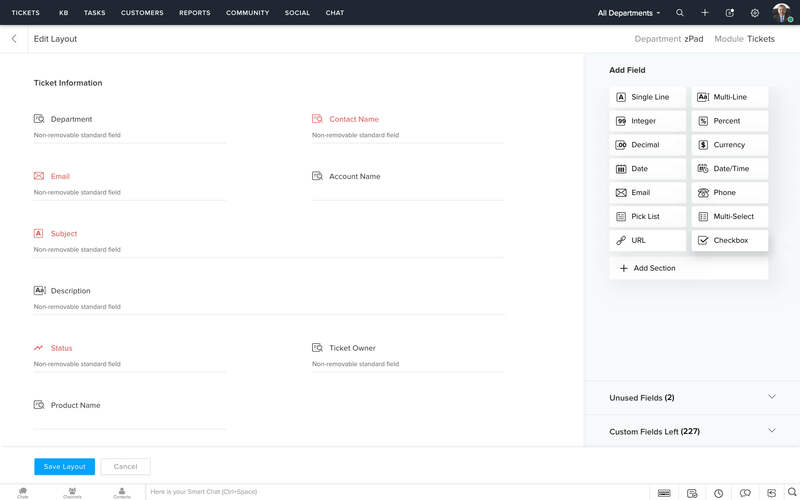 You can integrate your Zoho Desk portal with your Salesforce account, and pull in a whole lot of customer context to boost your customer service efforts. This helps bring your sales and customer support teams closer together, without having to wait around for updates, or even switch applications. 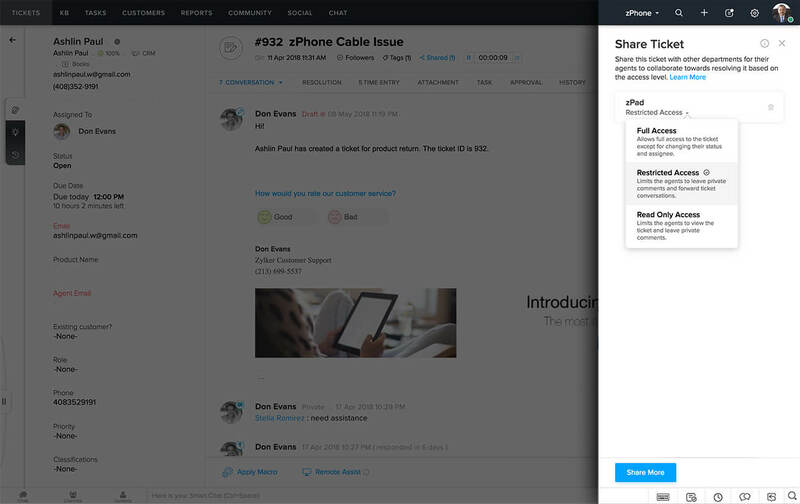 With Zapier, your apps can interact with one another to share important data efficiently. 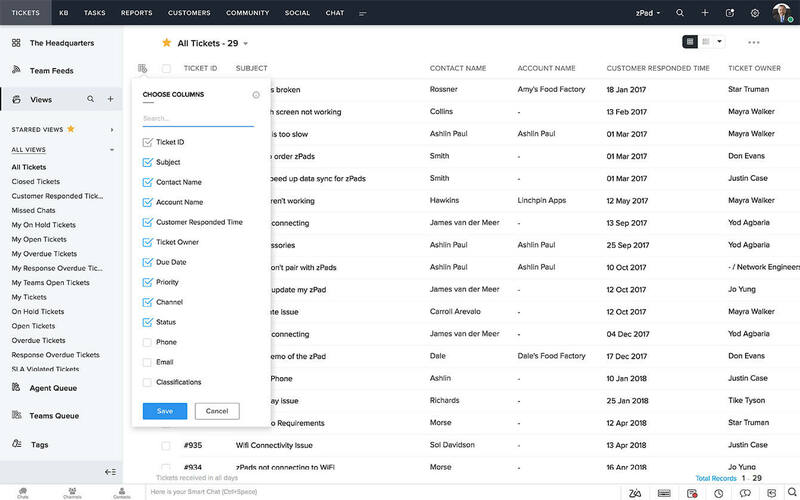 Zapier lets you automate manual tasks such as converting emails or social media posts into tickets, send replies, add comments, and create contacts by integrating with right tools. Managing everyday tasks become a lot simpler, so you can focus on delivering prompt customer service. Zoho Dest now lets you access a more flexible and customizable live chat solution, powered by SalesIQ. 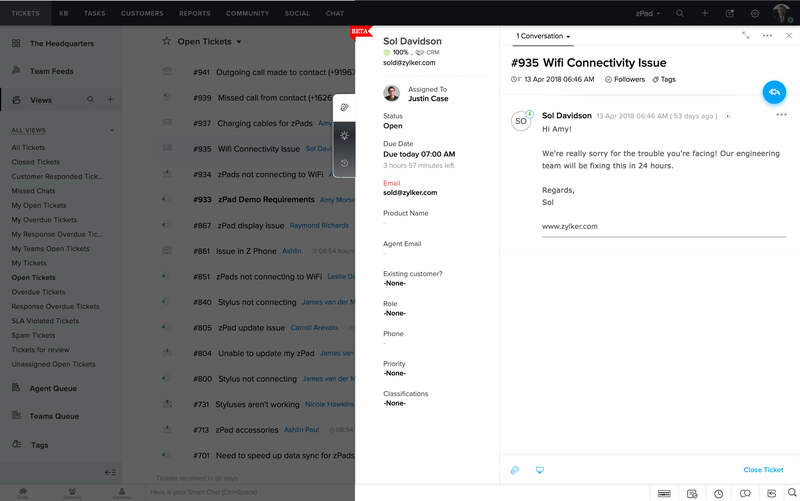 With this update, you can now get the best of live chat and insights right within your help desk. The SalesIQ integration runs both ways and lets users access chat tickets on either of the two interfaces. We understand that you may have an existing telephony system that you've set up or wish to purchase. To accommodate your preferences, Zoho Desk '18 has a host of new telephony partners for you to choose from, including Jive, Zadarma, Foneco, Amazon Connect, Babelforce and DuoCom. Check out your new options. Migrate from Freshdesk in a jiffy! If you're a Freshdesk user looking to switch to Zoho Desk, you have a stress-free transition ahead. Zwitch is designed to seamlessly migrate all your data from Freshdesk to Zoho Desk with a few quick steps. What's more, our dedicated team will make sure that your onboarding is a breeze.